Trump’s defense budget guidelines are a terrible misuse of money. Trump’s staggeringly pointless increase of the defense budget is a sure way to undermine American security. President Donald Trump dellivers remarks after attending a swearing-in ceremony for Defense Secretary James Mattis (right) at the Pentagon in Washington on Jan. 27. President Trump may think that he’ll make the nation more secure by spiking the defense budget and slashing the rest of the federal government, but he’s indulging in clichés and dangerously false assumptions. It’s not even clear how the military would spend such a hefty bonus. The wars we’re fighting now don’t require huge, expensive weapons systems. President Obama’s last budget, which the Pentagon is spending now, allotted $7.5 billion for the war against ISIS, $6.7 billion for cyber defenses, and $1.2 billion for counterterrorist drone operations. Double all that, and you’ve spent an extra $15.4 billion, less than one-third of Trump’s increase. If Trump thinks we’re headed for a revival of major wars, with tank battles and air-combat duels and naval skirmishes, extra money will get him only so far. That same Obama budget earmarked $27 billion for warships, $45 billion for combat planes, $8 billion for missile defense, and $30 billion for maintaining and modernizing the nuclear arsenal. You can build new ships, planes, missiles, and submarines only so quickly—and how many more of those things does the nation need to meet the threats? His premise is that the nation’s defenses are “depleted,” and he’s simply wrong. Obama’s final Defense Department budget was $583 billion. (This is the baseline for Trump’s $54 billion increase, which amounts to a 9.2 percent increase, close to the advertised 10 percent.) Add to this the $25 billion for the Energy Department’s nuclear program, and that makes a total “National Defense” budget (as the Office of Management and Budget calls it) of $608 billion. * This is the largest U.S. military budget in the post–9/11 era. In fact, adjusting for inflation, it’s as large as any budget since the peak of Reagan’s era. If there were deficiencies in Obama’s war policies, they did not stem from a shortage of weapons or manpower. Many Republicans, including Trump, like to say that the nation has fewer planes and ships than at any time since the end of World War II or since some other signpost from the distant past. Assuming the numbers are accurate, they’re irrelevant. The firepower of a single aircraft carrier dwarfs the entire fleet of any nation from earlier eras. No generals or admirals would say they’d trade the force of today with that of any yesteryear. One might argue that the military needs more weapons of specific types to meet rising threats of a certain sort. If so, the question isn’t how much to spend but what to buy. Trump’s directive spells out no such details. Those will be filled in and hammered out later by the Office of Management and Budget, the comptrollers of the various departments, and the relevant committees in Congress. Meanwhile, simply throwing money at the Pentagon won’t necessarily solve the problems, especially if it means taking money away from other buildings in town. I hope this is what Secretary of Defense James Mattis tells his president. When Mattis was a four-star Marine general in charge of U.S. Central Command, he told a congressional committee, “If you cut the State Department’s budget, then you need to buy me more bullets.” In other words, defunding diplomacy makes war more likely. 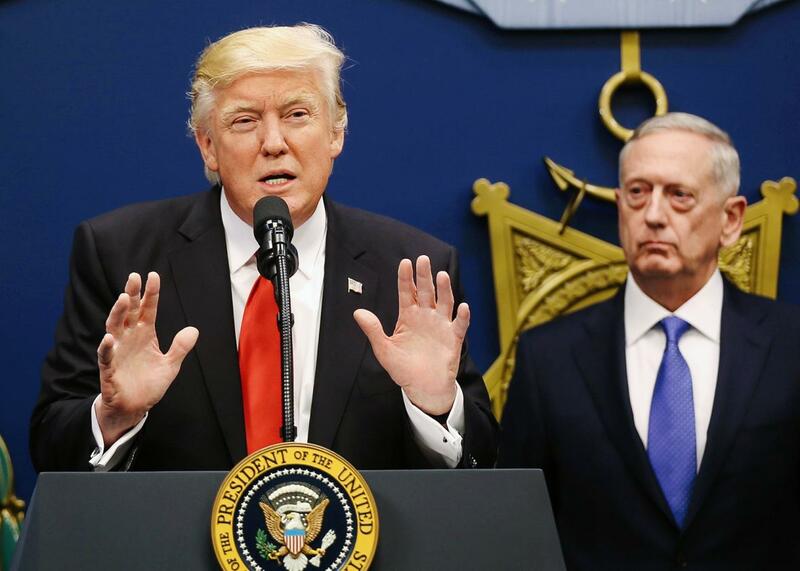 Trump might respond by invoking the Reagan-era slogan “peace through strength.” Mattis would agree, but he subscribes to a broader concept of strength that goes beyond merely military might. Certainly he wouldn’t turn down a bigger barrel of money for the Department of Defense, but he knows that it’s not the only measure of national security. With just a few tweets and phone calls, Trump has done more damage to our security than if he’d cut tens of billions of dollars from defense. And currently there is no functioning State Department to conduct the day-to-day diplomacy that, Mattis knows, forms a crucial bulwark to bloodshed. Trump’s budget guideline is a declaration of his one-dimensional priorities, and—even leaving aside matters of social needs and domestic policy—his priorities are all wrong.